Almost 10,000 sablefish were caught, tagged and released by biologists in the spring of 2018. That’s good news for anyone who catches a tagged fish. A fisherman, or rod-and-line angler, who removes the orange plastic numbered tag and returns it to a Fish and Game office is rewarded with a shirt. Providing a little data – the GPS coordinates where the fish was caught and the date – qualifies the tag re-capturer to be entered into an annual cash drawing for a $1,000 first prize, two $500 prizes or four $250 prizes. The shirts and cash provide incentives for the public to contribute to sablefish monitoring and research. 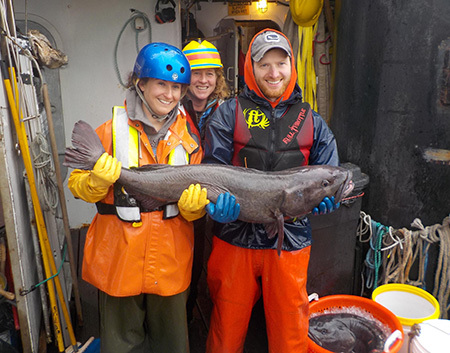 Sablefish (also known as black cod) are tagged by biologists with the Alaska Department of Fish and Game in May and June during surveys aboard the state research vessel Medeia. Andrew Olson, groundfish project leader for Southeast, said fish were caught, measured, and tagged at locations along Chatham Strait in Southeast Alaska. 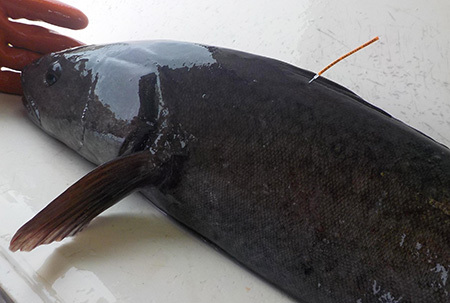 Tagged fish are released and mix in with the general population of sablefish in the area. They are subsequently caught by commercial and sport fishermen, and also by biologists during annual longline surveys. “We’ve caught fish five years after we’ve tagged them,” Olson said. 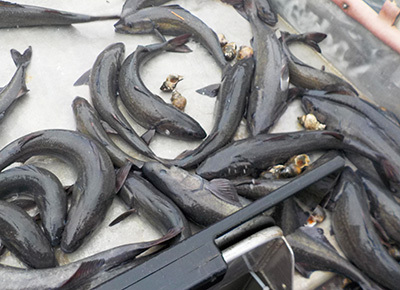 Comparing the numbers of recaptured fish to the original number of marked fish allows biologists to determine a population estimate (a method known as mark/recapture). Looking at the locations helps biologists understand sablefish movements, and comparing the measurements provides growth data. There is a lot to learn about this high-value commercial fish, which is prized for its tasty, rich meat. The sablefish are caught using pots, strung on a longline. Pots are ideal for catch-and-release fishing. Unlike hooks on a longline, which can injure a fish’s mouth, fish caught in pots have less chance of being injured. Pots are baited with a mixture of pollock and squid. Olson said there were typically 40 pots per set, and they usually made two sets a day, “soaking” the pots for 10 to 24 hours. That changed over the course of the survey because the fishing was so good. The best single set yielded about 1,070 sablefish in 40 pots. The largest fish was 108 cm, about 42 inches long. One reason for the success of the 2018 survey is a big recruitment of sablefish entering the population in Southeast waters. There is an abundance of fish from the 2014 age class – juvenile fish in the 40 to 50 cm (15-20 inches) size range that are approaching maturity. Federal biologists with the National Oceanic and Atmospheric Administration (NOAA) are also monitoring population trends with sablefish. Sablefish are well suited to the pot survey method for several reasons. Lacking a swim bladder, they don’t experience barotrauma, which stresses and can kill rockfish when they are caught and released (unless they are released at depth with a special device). Sablefish prefer a soft substrate like mud, which is ideal for pot fishing. “They are easy to release and have a high survivability,” Olson said. That’s good, because sablefish are long-lived, and can reproduce for decades once mature. Sablefish are known to live into their 90s, and Fish and Game aged a 97-year old sablefish caught in Prince William Sound. Olson said one sablefish mystery biologists would like to better understand is where they reproduce. Sablefish inhabit some incredibly deep waters, from 300 to 2,700 meters (about 1,000 to 9,000 feet) deep. Some remarkable travels have also been documented by researchers: a sablefish tagged in upper Chatham Sound in May 2012 was caught four years later in April 2016 off the coast of Eureka, California, 2,066 km (almost 1,300 miles) away. Another, tagged in Lower Chatham in June 2007 was caught in October 2009 near the western end of the Aleutian Island chain 2,888 km (almost 1,800 miles) away. The tagged fish program is yielding good data for the biologists. Olson said in 2017, 782 tags were returned. Future surveys and research, combined with cooperation from the fishing public, will help biologists learn more about these tasty deep sea dwellers. Riley Woodford is the editor of Alaska Fish and Wildlife News, the monthly online magazine of the Alaska Department of Fish and Game.